It’s that time of year again! The Summer Coffee Lovers Blog Hop kicks off today. Yay! The worst part of summer? Summer colds!! What could cheer one up more than an hot cuppa coffee or tea,a yummy short stack and some sunny summer flowers in bed?!! I faded the red to pink and used lots of circles – plus the roses on the ‘bedspread’ reminded me of those roses. Simon Says Stamps Wednesday Challenge is to use patterned paper: I had started off with some chevron paper from Fancy Pants Design as I was going to make a quilt to cover the bed. (More on that in a minute). For the paper-pieced items on the tray I had to place a couple of pieces together with scotch tape and then die-cut. You don’t notice the seam unless you look close. Unfortunately, the quilt didn’t look right… the tray kind of got lost on it. Well, when you think about it – who has dishes that match their bedspread?!! lol! So I chose a muted floral pattern for my bedspread. The wood paneled walls are made from the packaging of the Fancy Pants ephemera and buttons sets… They outta make that pattern into cardstock, I love it!! The pillow and tissues are made from a real Puffs tissue. I am participating in the following hops and challenges. Click on any one of them for more information on how you can join the fun! I’d hoped to do a belated blogiversary giveaway sometime soon, but haven’t been well enough and now I have meet with the surgeon on Monday. So, perhaps in a few weeks when I’m better we’ll have a party! You might want to be subscribed to my blog so you don’t miss it! (hint-hint) Meanwhile, I’ll be back tomorrow with another fun card for the Coffee Lovers Hop. Hope to see you then! Happy hopping!! 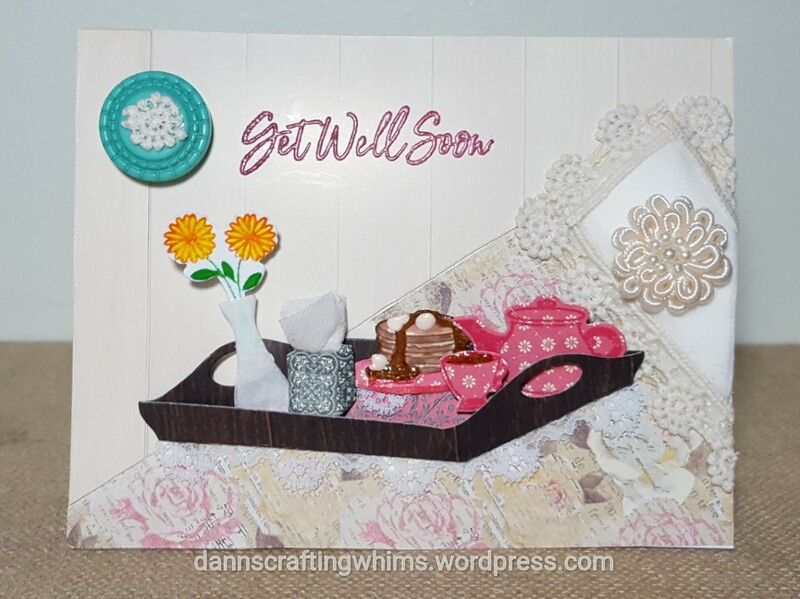 This entry was posted in Cards, Get Well Cards, Papercraft and tagged Breakfast In Bed, cardmaking, coffee, Fancy Pants Designs As You Wish, FancyPantsDesigns, Get Well Cards, handmade cards, pancakes, Papercraft, SPDMIU32, ssswchallenge, SugarPea Designs Breakfast in Bed, SugarPeaDesigns, Summer2017CLH, Tea, Tombow adhesive, Tombow dual brush pens, Tombow Xtreme, TombowUSA, Tonic Studios Nuvo Crystal Drops, Tsukineko Amplify by dannscraftingwhims. Bookmark the permalink. I love your get well card! So many really cute deatils! what a clever design! 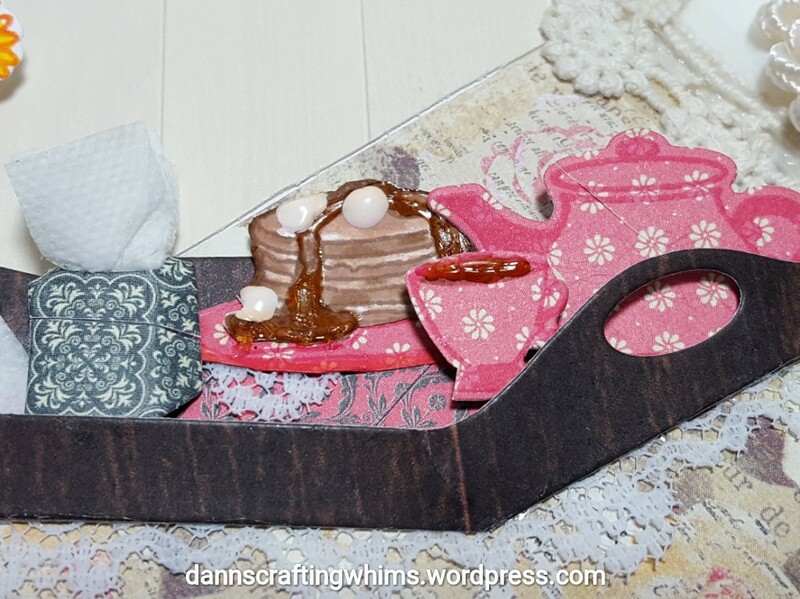 love your breakfast tray! it looks like pillow is it pillow? I love visiting you! Your card is amazing…so clever and thank you for the inspiration…I have that SPD die set! That 10 day weather forecast….hahaha…you’re awesome! So very creative, D.Ann! I love this. I love that used real Puffs for the tissue and pillow. 🙂 And the forecast is way funny and I agree, more accurate than the real weatherman here in So. Florida. (And P.S. I found a Hoya near ready to bloom! Thanks for the heads up on where to get one – I’m so excited!!). Awesome card and love the weather forecast too! Great details and design! Thanks so much for taking part in Simon Says Stamp Wednesday “Patterned Paper” Challenge! I saw this card on IG and it’s amazing! Love how sweet it is. Very pretty get well card with this tray of goodies. Love all the gorgeous details on this card, such an awesome design! Your get well card is lovely, I would instantly be better! But your weather forecast, that caught my eye and is totally creative and fun!! I would love this to be on the tv!! Wow! Such a pretty card! Love all the details! Super creative card and love your weather calendar. Love the use of a trey, super creative card! Gosh your forecast looks just like mine! Love this … what an awesome creation! So many beautiful details!.. love!! Such a clever and creative card! And that forecast is so fun. Sweet card, there are so many pretty details!! Thanks for sharing. Awesome get well card. I love the tray scene and papers. Wonderful card. Oh my gosh! Love this card so much!! Hmm that SPD set is going on my must have list. Great card!. I LOVE your bed spread and the little tray filled with goodies! And I also love your coffee and crafty weather forecast LOLOLOLOL!!!! Your card is beautiful! I love the bedspread and the lovely tray full of goodies! Can you bring that to me tomorrow morning please?